Gaming elite. 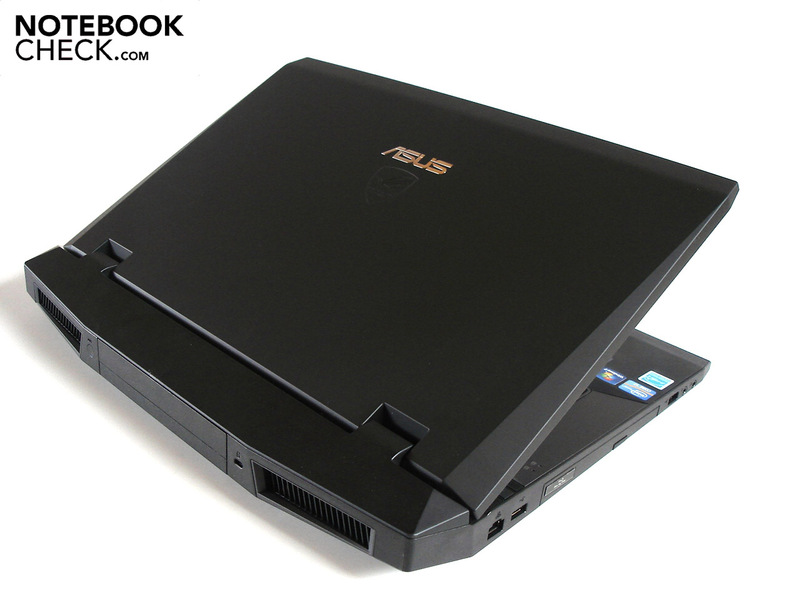 Asus is now offering its high-end 17-inch G73 notebook with a brand-new Intel Sandy Bridge processor. 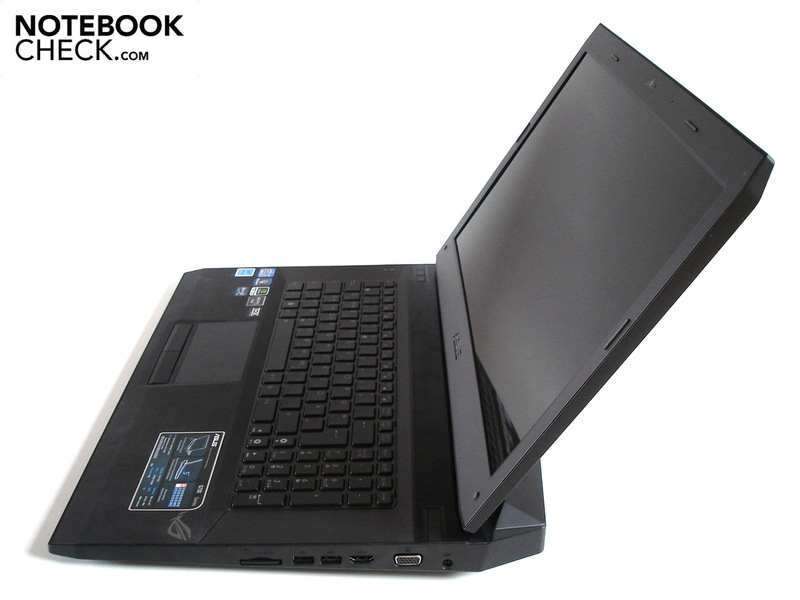 The powerful quad-core i7-2630QM is accompanied by an Nvidia GeForce GTX 460M. Find out in our review whether the G73SW will have the competition quaking in their boots. 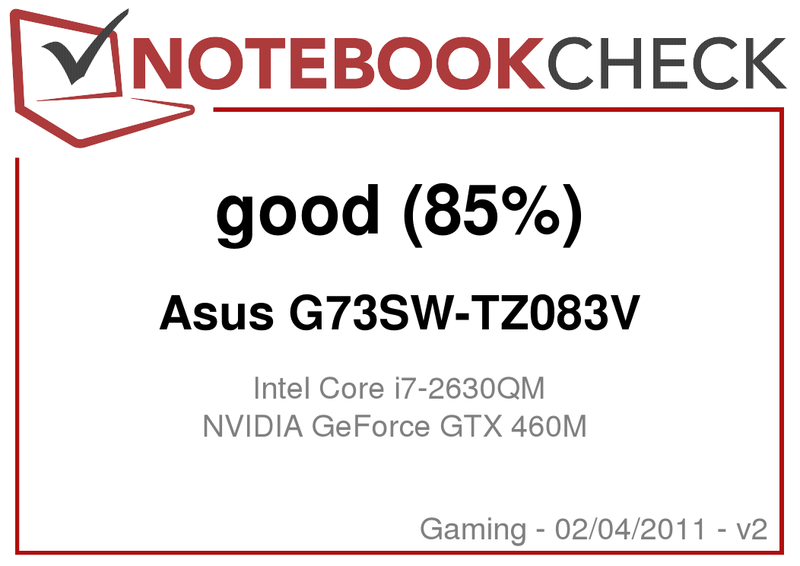 Asus released the G73 a few months ago as an ambitious successor to the G71 and G72, good but by no means exceptional gaming notebooks that came out during the last couple of years. 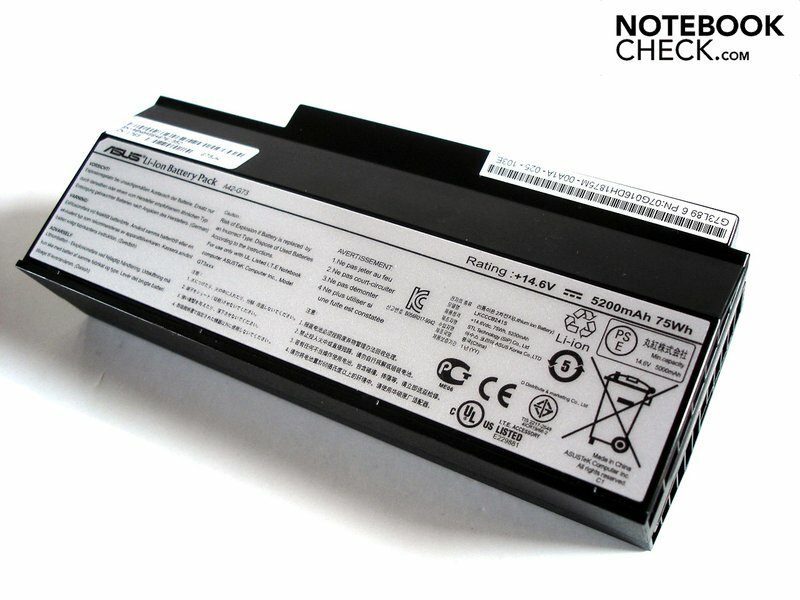 Compared to these, the G73 scores highly for the flawless workmanship of its matt casing, as well as its relatively low temperature and noise emissions. Asus then followed up this G73JH (Radeon HD 5870) with another version, the G73JW (GeForce GTX 460M). The G73SW is the latest version to be released and to find its way to our review team. The graphics card remains unchanged but the processor is now one of Intel’s lightning-fast Sandy Bridge models. In Germany at the moment there is increasingly only one variant of the G73SW available: the G73SW-TZ083V, which comes fitted with a Core i7-2630QM, 8 GB of DDR3 RAM, two hybrid hard drives each with a 500 GB capacity, and a Blu-Ray DVD burner. The cost: around €1,800. 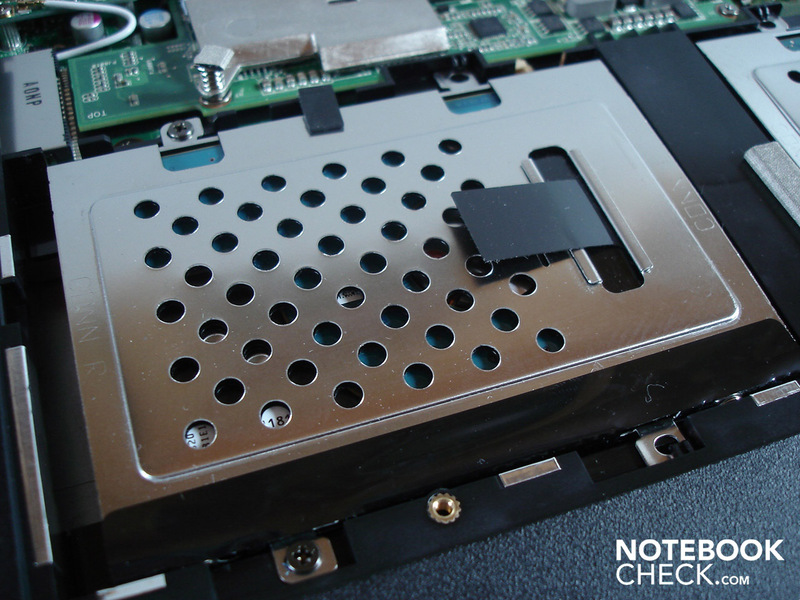 NB: Because of the problems currently affecting the Intel Sandy Bridge chipset, notebooks like this one may be subject to delays in delivery. Further details and continually updated information about this topic can be found here. As we have already reviewed the G73 three times and the casing has not changed at all, we will turn our attention straight to the display. 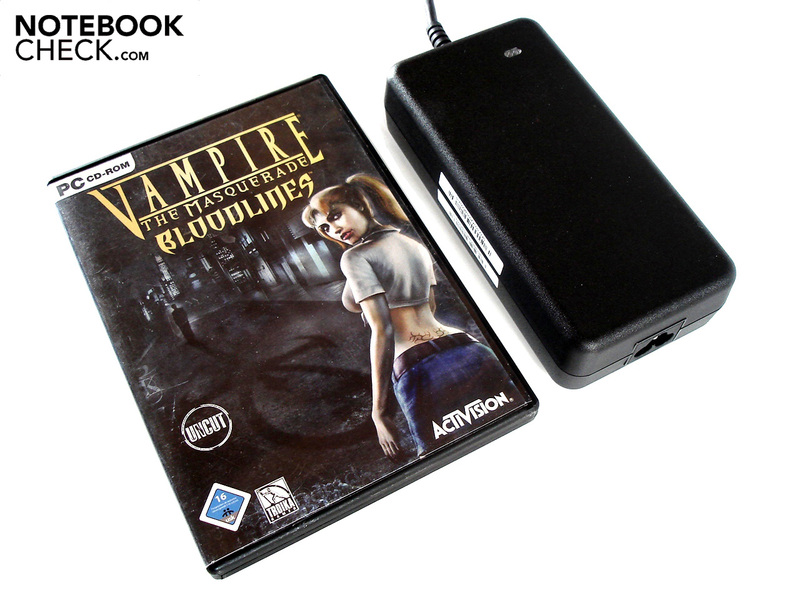 For details on the case, connectivity and input devices, we direct you to our original review. 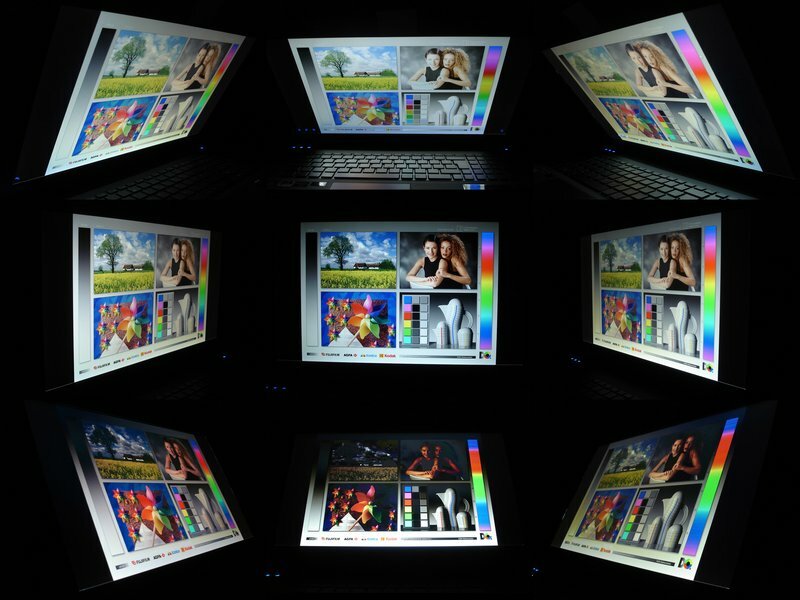 The G73SW’s 17.3-inch screen has a diagonal length of 43.94 cm and a 16:9 aspect ratio. The resolution - not surprisingly - is 1920 x 1080. 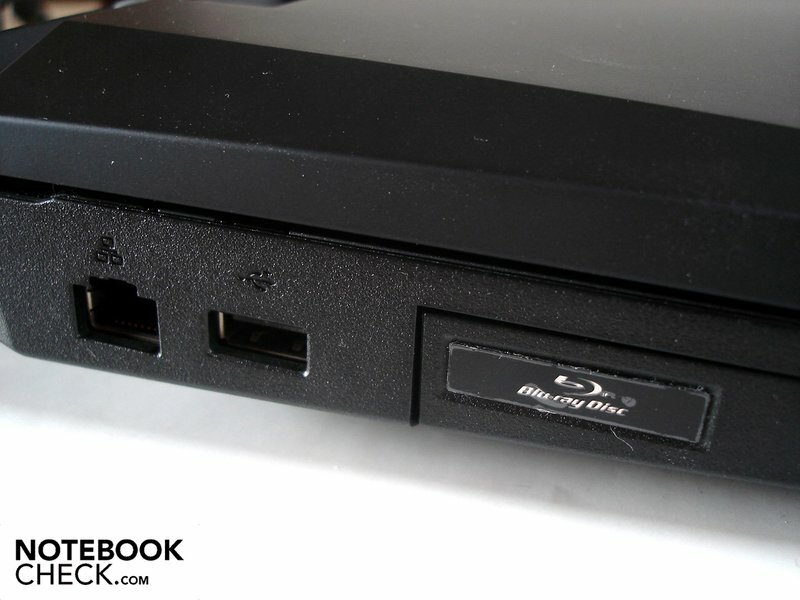 Thanks to this Full HD resolution, the integrated Blu-Ray drive can show its full potential. It also gives you enough screen space to work comfortably with several adjacent windows at the same time. As with the last version we reviewed, the G73SW is fitted with a high-quality Hannstar HSD173PUW1 display. The screen’s low black level of 0.29 cd/m² is particularly impressive. It means that dark areas on the screen actually do appear a deep black rather than the dark grey that you see from the majority of the competition (with black levels generally over 1.0 cd/m²). The screen’s average brightness of 213.4 cd/m² is in no way exceptional, but games and films appear bright enough. A very good contrast ratio of 738:1 is produced. You can perceive subtle differentiations in the picture, with extremely vibrant colours. In short: the built-in display is a pleasure to use, and there is no need to rely on an external monitor for the G73SW. The G73SW is less suitable for outdoor use. 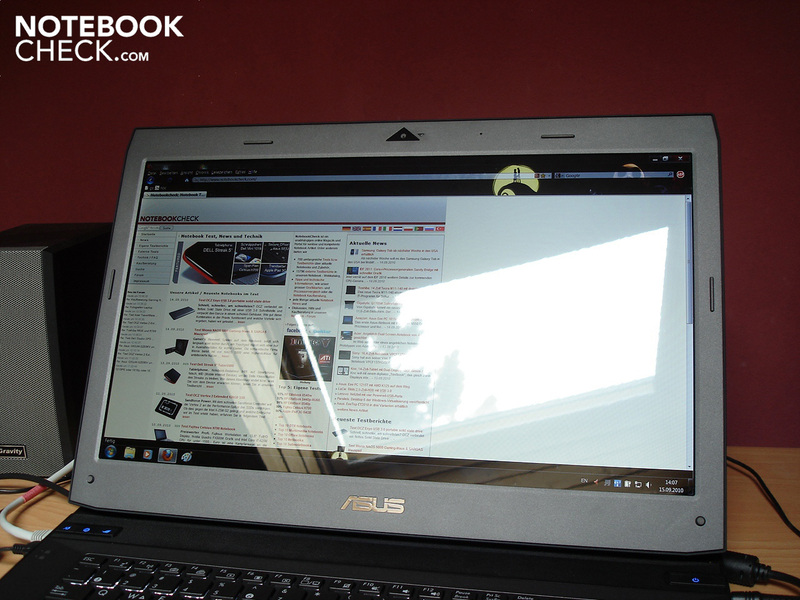 Since Asus has opted for a glossy screen, you frequently get distracting reflections. Even indoors, you need to pick your spot very carefully. Making the room darker can also help. The screen’s viewing angles are fine. Horizontally the picture barely changes even at a large angle. Vertically, and especially from below, distortions in the picture appear sooner; but compared to rival notebooks the G73SW does pretty well. The powerful Core i7 Intel processors are currently the only real choice for demanding gamers. Intel has further extended its lead in the market with the new Sandy Bridge generation. As our testing showed, the old Clarksfield models (e.g. Core i7-740QM) have been significantly overtaken. 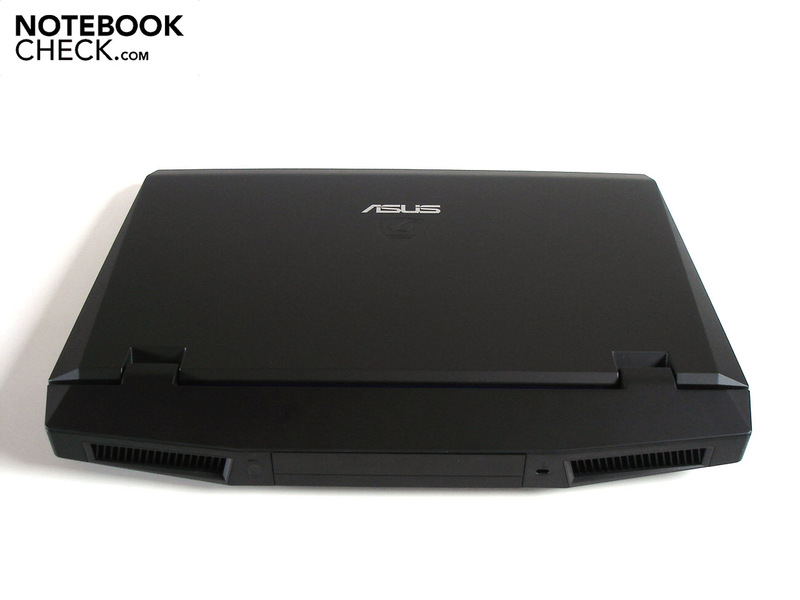 Asus is one of the first manufacturers to put notebooks on the market which feature these freshly minted Sandy Bridge processors. Inside the G73SW-TZ083V is a powerful quad-core Core i7-2630QM processor, made using the modern 32 nm process. Thanks to the Turbo Boost function the speed can be increased - depending on CPU usage and temperature - from the standard 2.0 GHz up to as high as 2.9 GHz. Many applications also benefit from the processor’s Hyperthreading technology: by simulating four additional cores, the Core i7-2630QM can process up to eight threads simultaneously. Other features of the processor include 995 million transistors, a 6 MB L3 cache and an integrated graphics chip called HD Graphics 3000. The energy consumption (45 W TDP) is respectable given the processor performance. The i7-2630QM’s performance is without question very good. In the single-core rendering part of the Cinebench R10 (64 Bit) test, the quad-core processor achieved an outstanding score of 4,507, which is 14% higher than the result of the Core i7-720QM (3,952 points) in the Asus G73JH-TZ014V. The differences become even more apparent in the multicore rendering (64 Bit) test, with the Core i7-2630QM leading by a massive 67% with 16,983 points to 10,148. But that’s not all: in the latest Cinebench R11.5 (64 Bit) benchmark it even secures a formidable 72% advantage (5.03 points to 2.92). So as not to hold the processor back, Asus has used a high-end graphics card alongside the Core i7-2630QM. The GeForce GTX 460M is based on Nvidia’s modern Fermi architecture (GF106 chip) and is made using the 40 nm process. Its speeds are certainly respectable, at 675 MHz (core), 625 MHz (memory) and 1350 MHz (shader) according to Nvidia’s specifications. However the GeForce GTX 460M is still a long way behind compared to the current top model, the GeForce GTX 485M, having ‘only’ 192 shaders as opposed to 352. But the graphics card does not suffer from memory bottlenecks, with the 1.5 GB of GDDR5 video memory having a 192 Bit connection. The GeForce GTX 460M also comes up trumps with its additional features; along with support for DirectX 11 and GPU-based video and physics acceleration (PureVideo HD and PhysX), the GeForce GTX 460M supports - at least in theory - stereoscopic 3D images (3D Vision, which requires a starter pack and a 120 Hz monitor). Sadly Asus has done without Optimus, a system for dynamically switching between the dedicated and integrated graphics units. The Asus G73SW performs well in the graphics benchmarks. In the GPU part of the 3DMark Vantage (DirectX 10) test the GeForce GTX 460M scores 6,677 points, placing it roughly 10% behind the Radeon HD 5870, which achieved 7,382 points in the Asus G73JH-TZ014V for example. The GeForce GTX 460M also loses out by some way against the GeForce GTX 470M, Nvidia’s latest performance hot-shot which is around 32% faster, scoring 8,787 points in the DevilTech Fragbook DTX. However, in the Unigine Heaven 2.1 benchmark (1280 x 1024, DirectX 11, high, tessellation normal) its advantage shrinks a little, with the GeForce GTX 470M only 25% better (with 29.6 fps to 23.6 fps). This hard drive configuration deserves to be called ‘generous’. 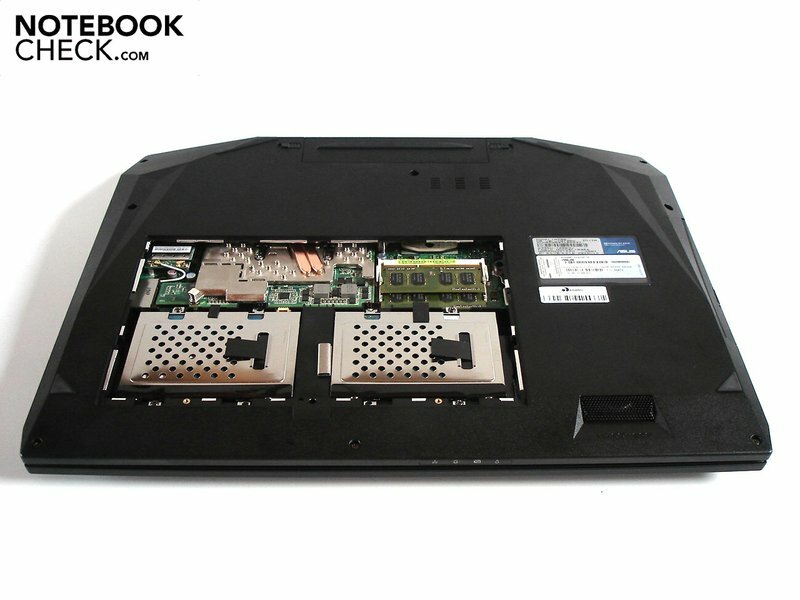 There are two hard drive slots in the case, which Asus has filled with two 500 GB SSH (Solid State Hybrid) drives. Hybrid hard drives are an attempt to combine the advantages of the familiar HDDs (high capacity) and the more modern SSDs (high speed), by combining conventional memory with a small Flash memory. The performance of the Seagate Momentus XT ST95005620AS (7,200 rpm) speaks for itself; its transfer rate of 82.3 MB/s is above average, as is the sequential read rate of 94.96 MB/s and the sequential write rate of 98.26 MB/s (testing the system SSH). To get any more performance from the drives, Asus would have to have set them up in a RAID-0 configuration. 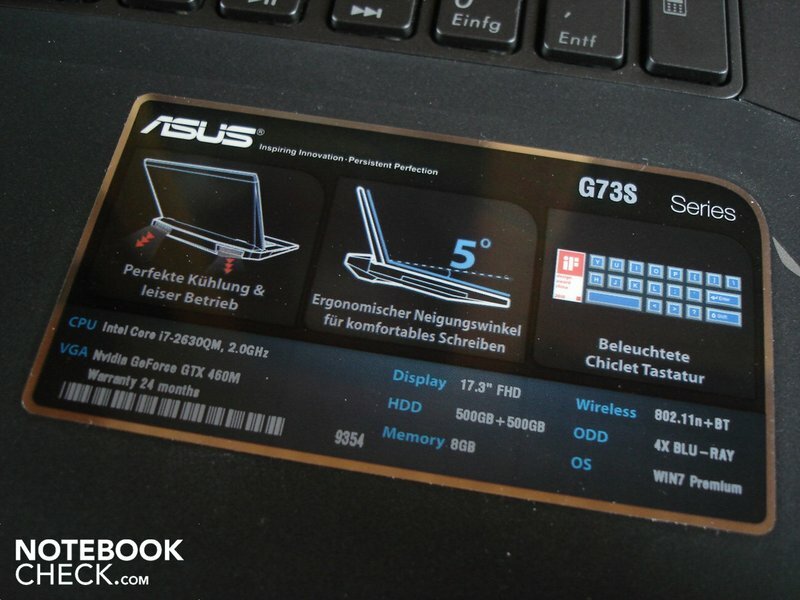 The Asus G73SW’s performance is impressive in every respect. Intel’s Sandy Bridge processor is so fast that the system does not lag even with the most demanding applications. 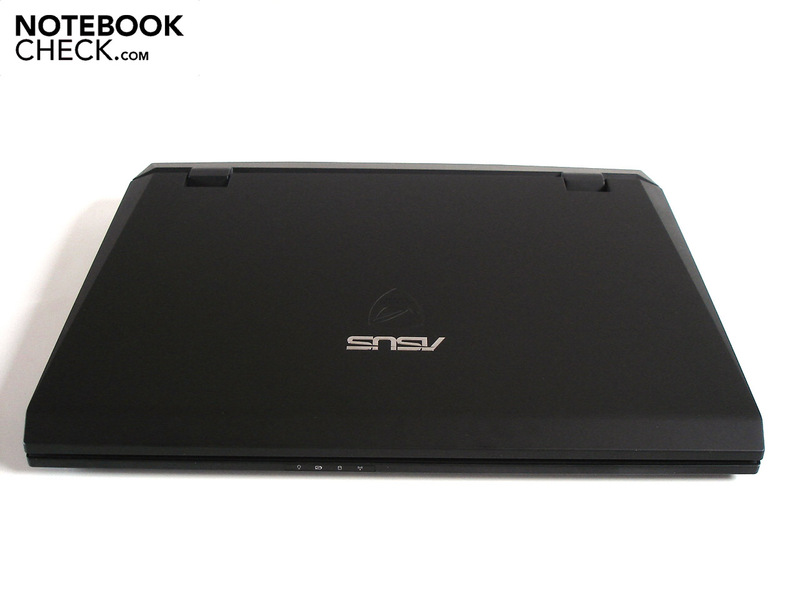 The 8 GB of DDR3 RAM and a total hard drive capacity of 1000 GB go some way towards making the notebook future-proof, and also provide plenty of room for your collection of media and data. The GeForce GTX 460M turns out to be a powerful companion to the processor, although the graphics card will probably be the limiting factor in the years to come. In our opinion, Asus might at least have used a GeForce GTX 470M for the price of around €1,800. We tested the Asus G73SW’s gaming performance using a number of modern games. We pitted the GeForce GTX 460M against its more powerful relative, the GeForce GTX 470M. 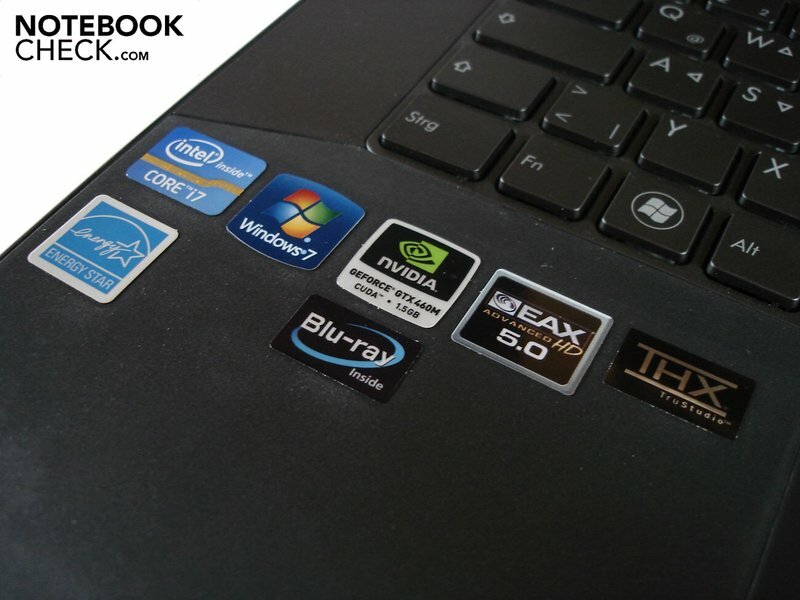 We used the DevilTech Fragbook DTX for comparison purposes, as it costs a similar amount and comes with a Core i7-2630QM, 8 GB of DDR3 RAM and a 750 GB HDD (see review). The benchmarks that follow were all carried out in the native Full HD resolution of 1920 x 1080. This latest Call of Duty spin-off is still very laggy on many systems. The Asus G73SW is sadly no exception. Although the very high details setting, 4 x AA (anti-aliasing) and 8 x AF (anisotropic filtering) result in a good frame rate of 55.7 fps, the game still seems to stutter about once a second. Developer Treyarch should issue further patches as soon as possible. In general the processor has a relatively large influence on the frame rate in Black Ops; the GeForce GTX 460M achieves only 47.2 fps with a Core i7-740QM (MSI GT663R) or 47.8 fps (Medion Erazer X6811). The GeForce GTX 470M pulls ahead by about 15%, reaching 64.1 fps in the DevilTech Fragbook DTX. 2K Czech, who developed this alternative to GTA, have placed less importance on creating a long game or one that is crammed full of detail, focusing more on depth of character and storytelling. The Asus G73SW was able to fluidly reproduce the integrated benchmark with high details and 16 x AF, achieving 34.7 fps, which is perfectly sufficient for a third-person game. However, the GeForce GTX 470M laughs in the face of this result, itself managing 46.1 fps, a 33% improvement. This real-time strategy by Blizzard is extremely popular both as a singleplayer and a multiplayer. 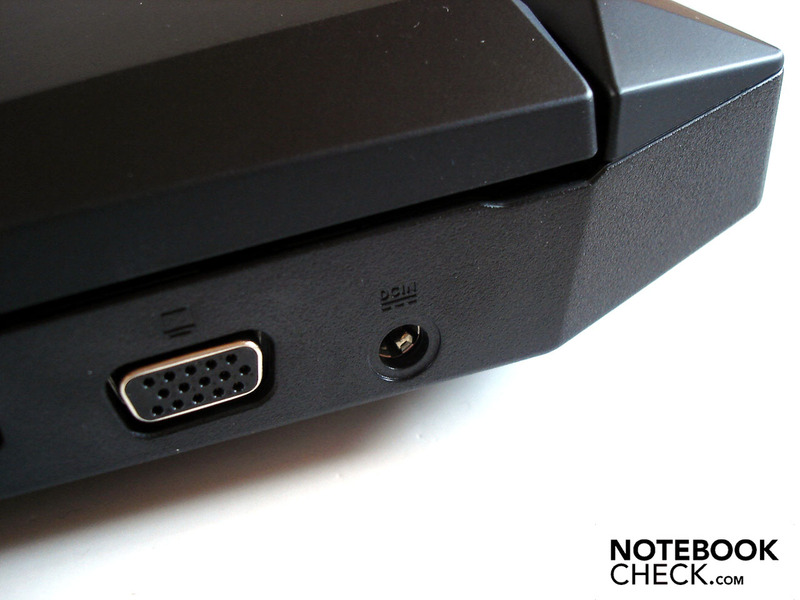 It does not present the GeForce GTX 460M with any particular difficulties. During the intro for the challenge ‘For the Swarm’ we measured a respectable 31.5 fps on the very high detail settings. The GeForce 470M is once again in a higher league, playing around 30% more smoothly on the same settings with a frame rate of 41.1 fps. This first-person shooter was the only game other than Crysis that could put the Asus G73SW in its place. Very high detail settings, AAA (analytical anti-aliasing), 4 x AF and DirectX 11 mode was definitely asking too much of the notebook. It managed only 9.4 fps, which is very far from being playable. The GeForce GTX 470M is 29% quicker on paper, but at 12.1 fps it makes little difference; the battle against the dangerous mutants is lost either way. If you want to enjoy this latest Battlefield spin-off properly, in the Full HD resolution of 1920 x 1080 and with high details, you will have to do without any additional quality enhancements. When using 4 x AA and 8 x AF the Asus G73SW settles at a not entirely smooth 30.1 fps. The GeForce GTX 470M pulls ahead quite considerably once again, with 37.5 fps, a good 25% lead. The Asus G73SW’s gaming performance is very convincing for the most part. Generally, the GeForce GTX 460M graphics card handles modern games without a problem even on (very) high resolution and graphics settings. Sometimes you can even activate the power-hungry anti-aliasing option, which visibly softens the jagged appearance of slanted edges. Only extremely demanding games like Metro 2033 or Crysis are too much for the Nvidia CPU on maximum detail settings. 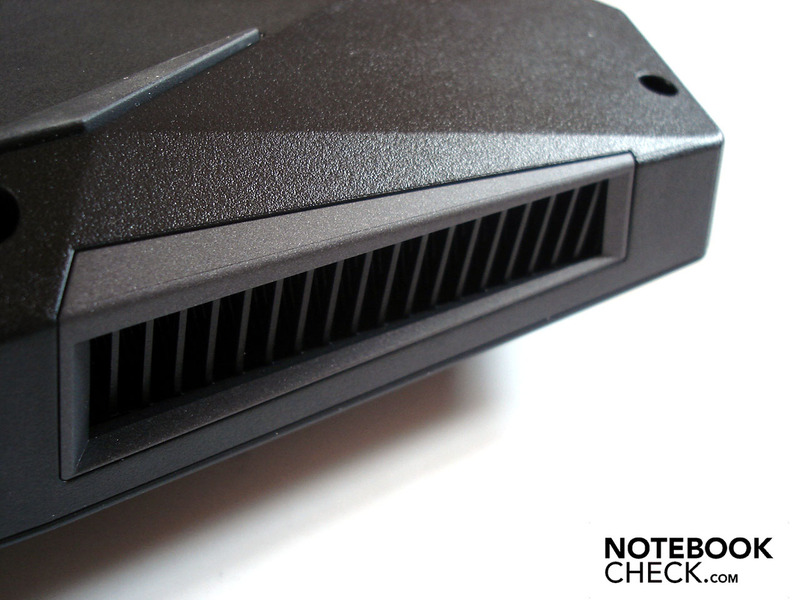 Overall the GeForce GTX 460M’s performance is roughly on a par with a Radeon HD 5870. The GeForce GTX 460M fares worse when compared to other models by the same manufacturer; it trails the GeForce GTX 470M by about 26%. Nevertheless, demanding gamers will find the GeForce GTX 460M to be a powerful graphics card, one that should cope well even with games that have yet to be released. But dedicated performance enthusiasts would be better off seeking out a more powerful graphics card like the Radeon HD 6970M or the GeForce GTX 485M. The Asus G73SW’s most unique feature is actually its surprisingly low temperature and noise emissions. The powerful cooling system keeps the components at a healthy temperature without reaching a volume that disturbs the user. In idle the notebook is only just audible, the two fans turning quietly and uniformly. As long as you’re not reading a massive amount of data, the optical drive and the hard drives also stay relatively quiet. With heavy use the noise level barely increases, so the atmosphere of games and films is not spoiled. And even with the notebook running absolutely flat-out, a fairly unrealistic scenario, the fans remain at an acceptable level - which is really very unusual for a high-end notebook. So noise-sensitive users should be very happy with this notebook; hardly any other gaming notebook on the market at the moment will allow for quieter gaming. There is also nothing to complain about when it comes to temperatures. 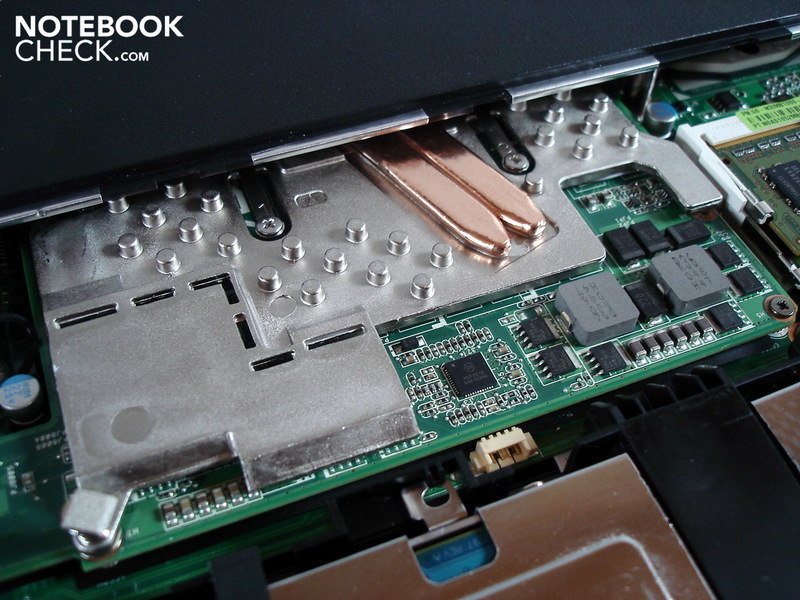 The notebook surfaces remain extremely cool in idle, with a maximum of 25.2 °C, an excellent value. Even under stress the G73SW is exceedingly comfortable to work with; we did not measure anything higher than 35 °C anywhere on the notebook. The palm rest deserves a particular mention, as it did not warm up the hands even after several hours of use. 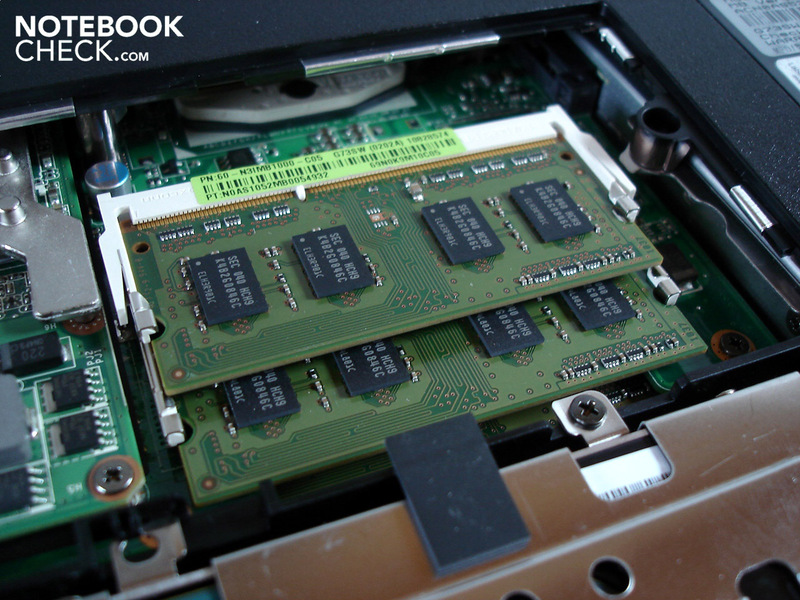 Let’s take a look at the notebook’s insides. If you let it run a while without any heavy activity, the processor and graphics card settle at around 30 °C, which is a respectable result. In our stability test with the Furmark and Prime tools, it was the graphics card in particular that heated up, but it reached an unconcerning maximum temperature of 73°C. A problem manifested itself with the processor. Its maximum temperature was significantly cooler at 58 °C, but the CPU temporarily slowed down to a measly 1.40 GHz. Fortunately nothing troubling came up during our comprehensive battery of benchmark tests, and so the CPU throttling is most likely limited to full-on 100% usage. (+) The maximum temperature on the upper side is 34.7 °C / 94 F, compared to the average of 39.3 °C / 103 F, ranging from 21.6 to 68.8 °C for the class Gaming. (+) In idle usage, the average temperature for the upper side is 22.1 °C / 72 F, compared to the device average of 32.9 °C / 91 F.
(+) The average temperature of the palmrest area of similar devices was 28.7 °C / 83.7 F (+4.7 °C / 8.5 F). 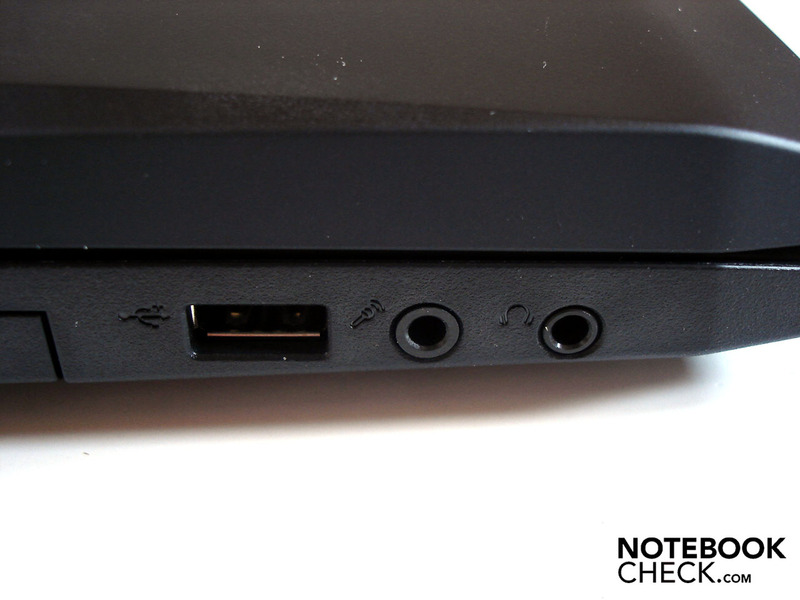 Notebook speakers that actually sound good are few and far between. 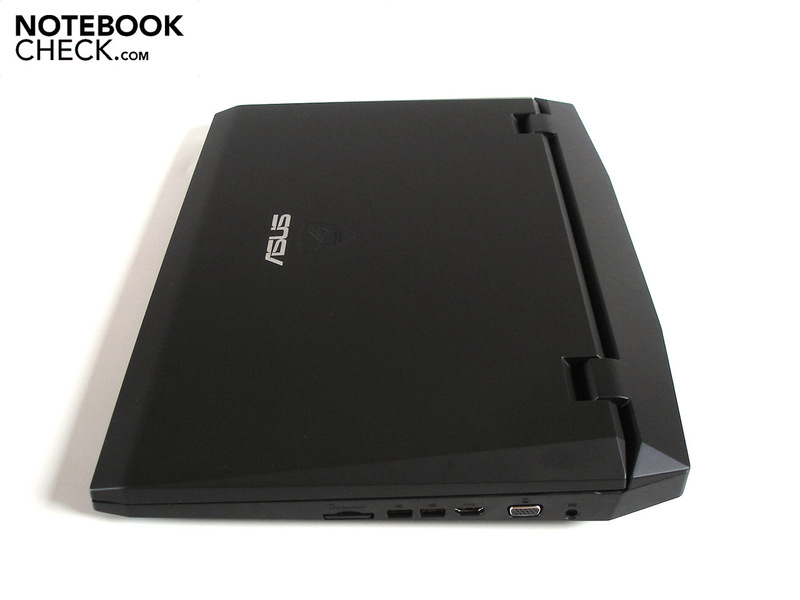 But the Asus G73SW is one of those rare notebooks that can produce sound of a decent quality. The 17-inch machine has a 2.1 system, consisting of two speakers (positioned above the keyboard) and a subwoofer (on the bottom of the base unit). The sound does seem a little muffled at times, but overall every variety of tone is reproduced relatively accurately. The sound comes across as quite full and powerful, with the subwoofer providing the appropriate emphasis. The G73SW also scores points for its high maximum volume. It can be turned up loud enough for you to hear everything perfectly clearly from several meters away. The 2.1 system also has a lot going on in terms of features. As well as “THX TruStudio” the G73SE also has “EAX Advanced HD 5.0”, a process developed by sound experts Creative which aims to represent ambient sounds in computer games as realistically as possible. PC games with support for EAX include such prominent examples as Colin McRae: Dirt or The Witcher. 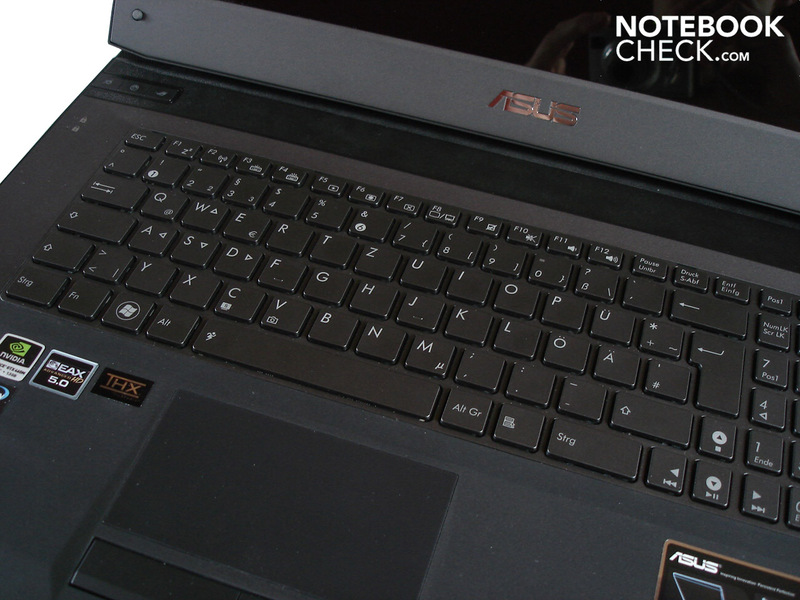 There are very few other notebooks with comparable sound quality; the Asus N73JQ, the Dell XPS 17 and the MSI GT663R would be good examples. Asus may have fitted the G73SW with a powerful eight-cell battery with 75 Wh (5200 mAh), but since the manufacturer also decided to do without a graphics switching option, the battery life is rather mediocre. Under stress (Classic Battery Eater test) with maximum brightness and deactivated energy-saving options, it lasted only 65 minutes. The run time was much better during DVD playback, lasting for two hours and 22 minutes, enough for most films (moderate energy-saving options). Surfing the internet over wireless is not a problem for the G73SW - and not every gaming notebook lasts for around three hours like this one (using Firefox 3 and Adblock). But you can’t squeeze much more than that out of it; in the Battery Eater Reader’s test with minimum screen brightness and maximum energy-saving mechanisms, it managed an acceptable three hours and 25 minutes. 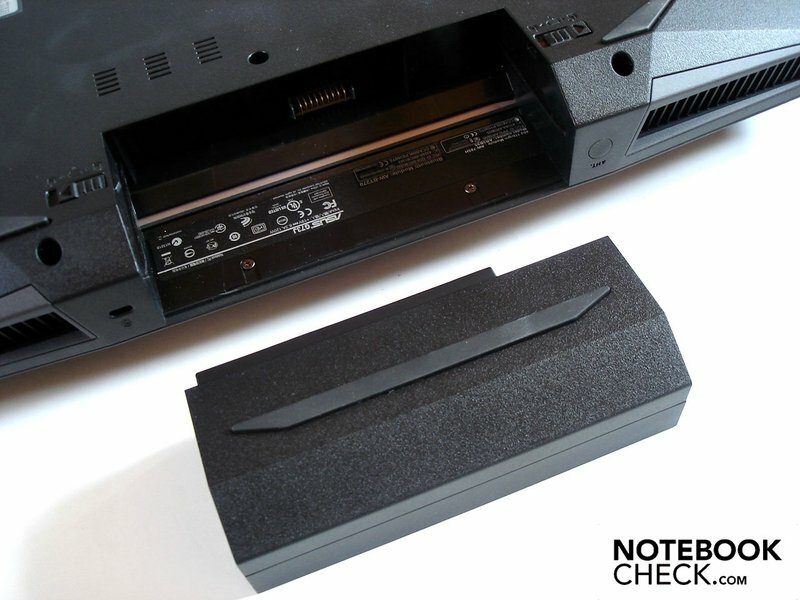 If you want longer battery life, you might like to take a look at the Alienware M17x R3 (see review). The energy usage should not attract any complaints. 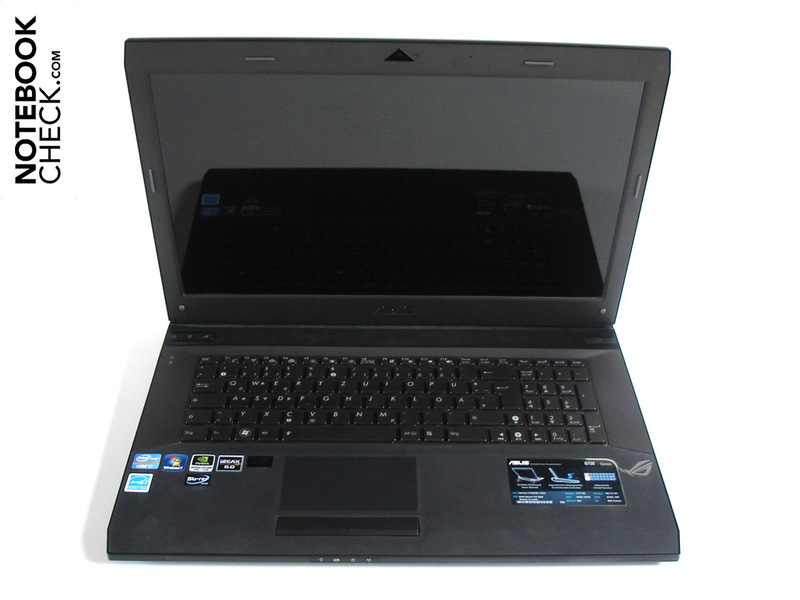 With 21.6 - 28.4 W in idle and 111.7 - 115.7 W under heavy use, the Asus G73SW consumes less energy than many other similarly powerful gaming notebooks (see for example the Medion Akoya X7811). 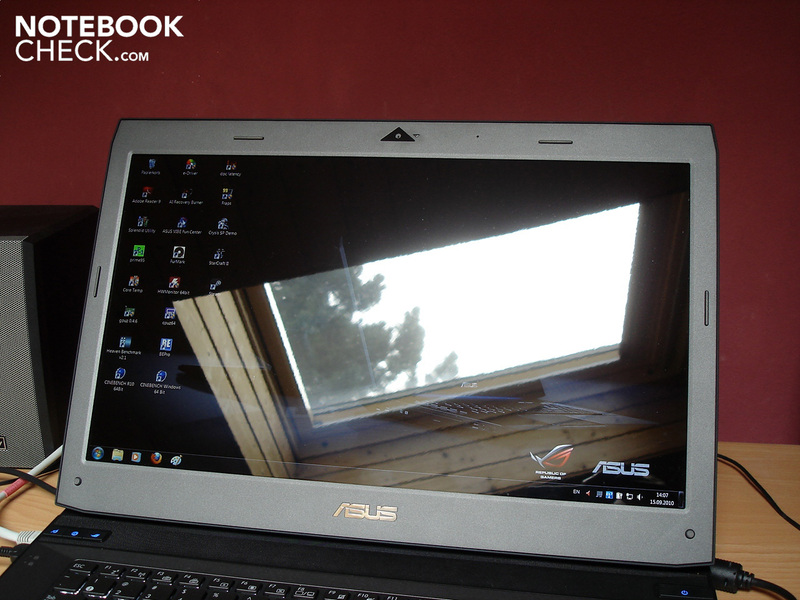 The Asus G73SW is entirely successful as a gaming notebook. With a height of up to 6 cm at the back and a weight of almost 4 kg, the case is on the bulky side, but flawless workmanship and matt surfaces give the 17-inch machine a very high-quality appearance. Asus also deserves credit for the excellent cooling system which keeps the case surfaces and internal components surprisingly cool even under heavy stress. At the same time the fans work fairly quietly, the level of background noise remaining unobtrusive throughout. The notebook has a better quality screen than the majority of its competitors; the Hannstar HSD173PUW1 display is in a class of its own. 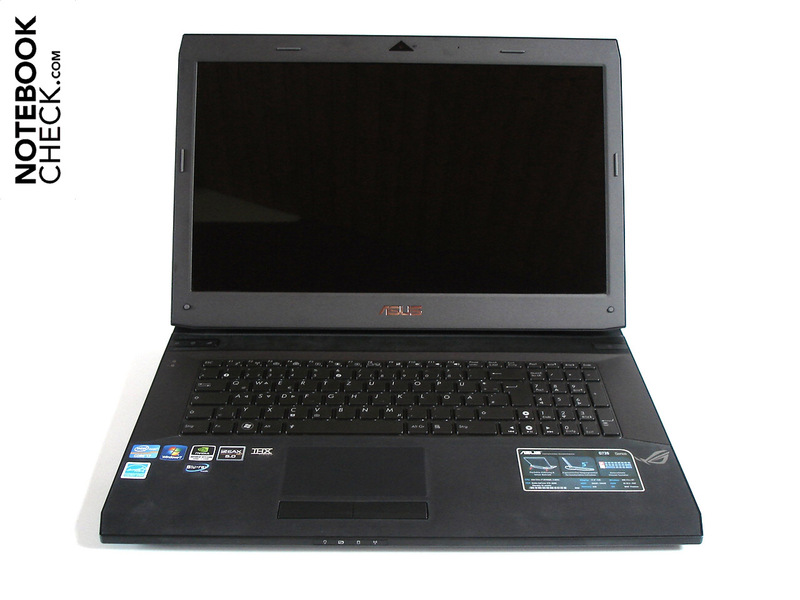 The Asus G73SW also does well performance-wise, the combination of Core i7-2630QM, GeForce GTX 460M, 8 GB of DDR3 RAM and two hybrid hard drives dealing confidently with almost everything that is thrown at it. Even the loudspeakers have been chosen with care, with the 2.1 sound system making external speakers unnecessary. 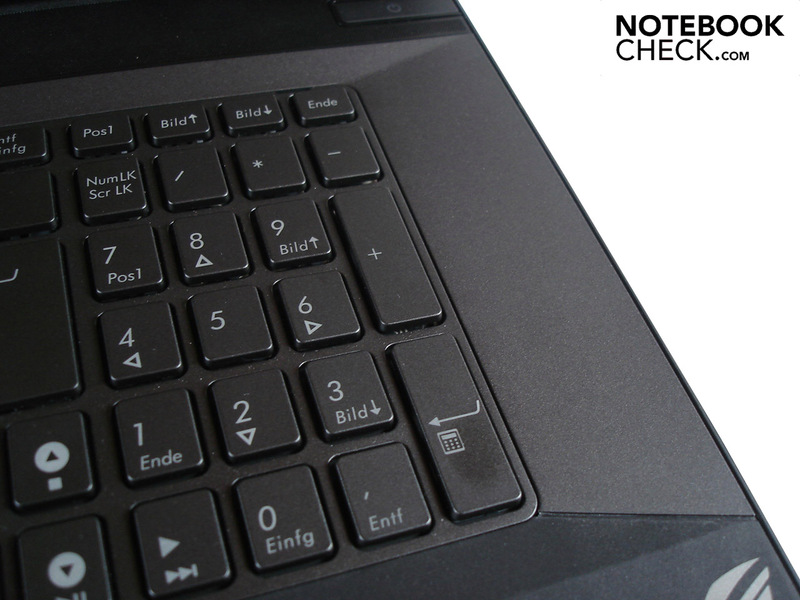 The spacious touchpad and integrated keyboard backlighting round off the list of good features. On the negative side, the first thing we would mention is the limited choice of ports. 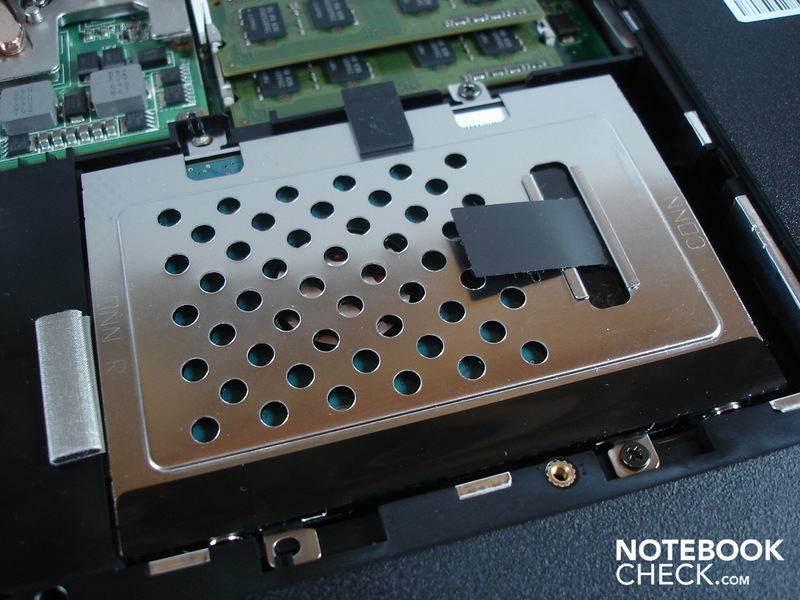 Many users will be sorely disappointed not to find an ExpressCard slot or an eSATA or Firewire port. We also found the layout to be far from optimal, with many ports placed annoyingly far forward. There is also room for improvement when it comes to the keyboard; the response from the keys is pretty poorly defined and typing feels spongy. 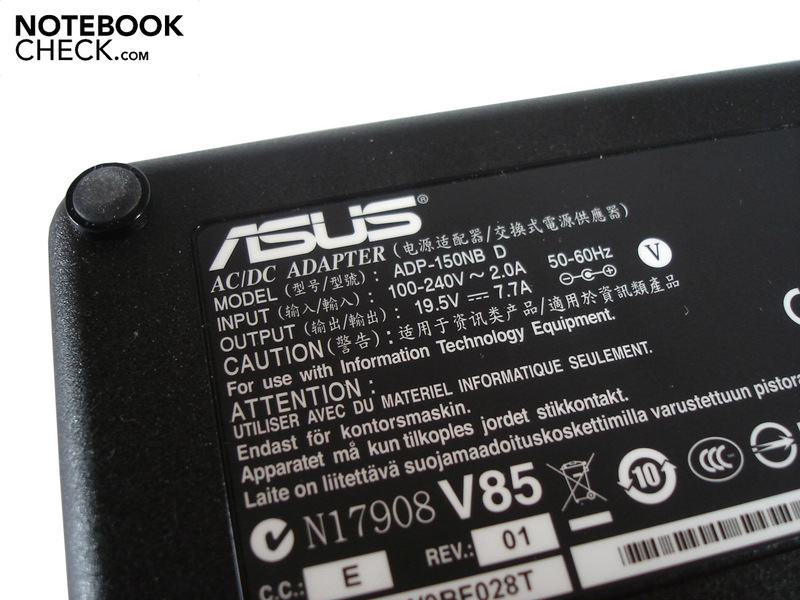 Finally, if Asus had included Nvidia’s Optimus technology, the battery life might have been longer. 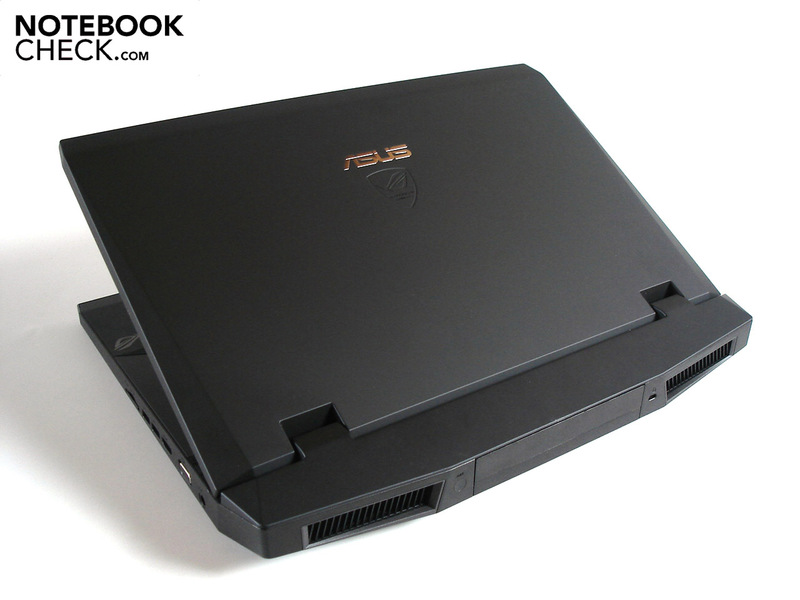 Overall the Asus G73SW is one of the best gaming notebooks currently on the market. Machines with similar performance like the Medion Erazer X6811 can be bought for significantly less, but in a direct comparison they lose out on several points (e.g. display and volume). 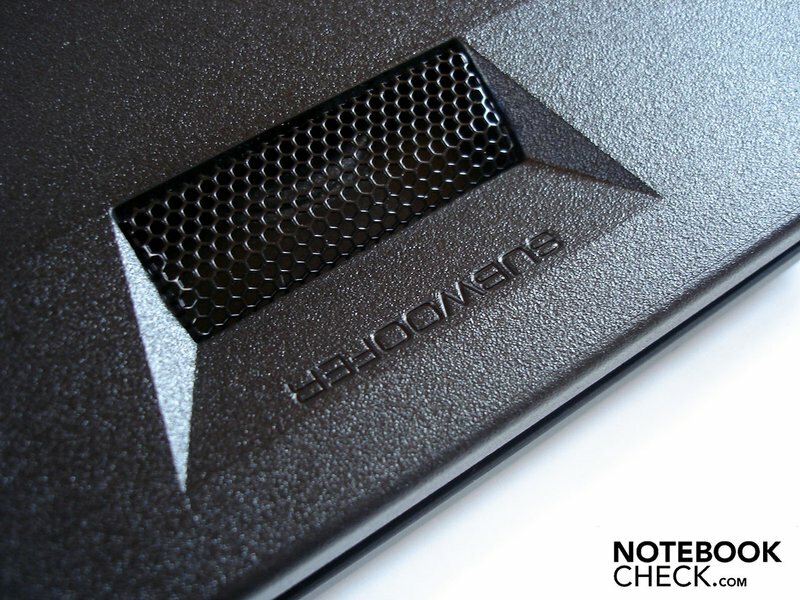 However, the notebook is not quite good enough to be our new favourite, as the (more expensive) Alienware M17x R3 is still just a touch better in terms of quality. The matt surfaces are slightly rubberized. The typing feel is rather spongy. Intel’s Sandy Bridge processors are incredibly fast. There is a subwoofer hiding on the underside of the case. 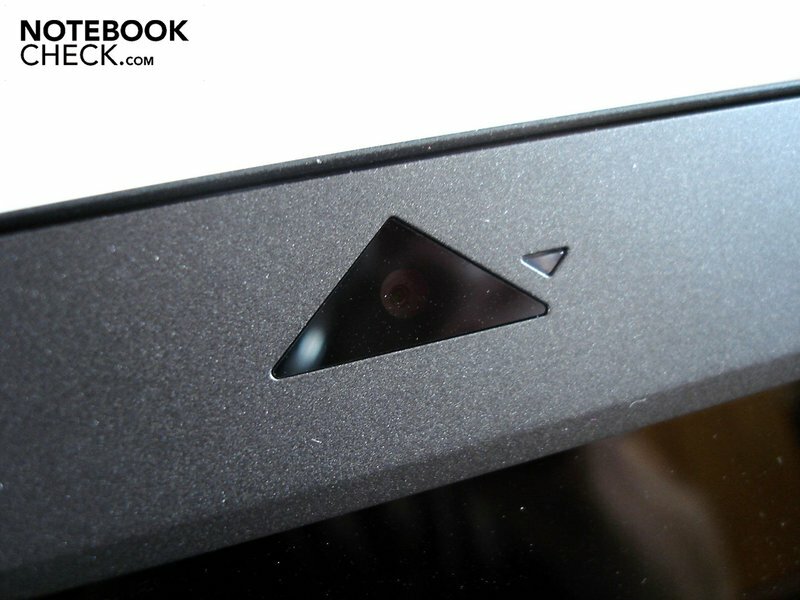 The integrated webcam has a resolution of 2.0 megapixels. The G73 is part of Asus’s ‘Republic of Gamers’ (R.O.G.) series. 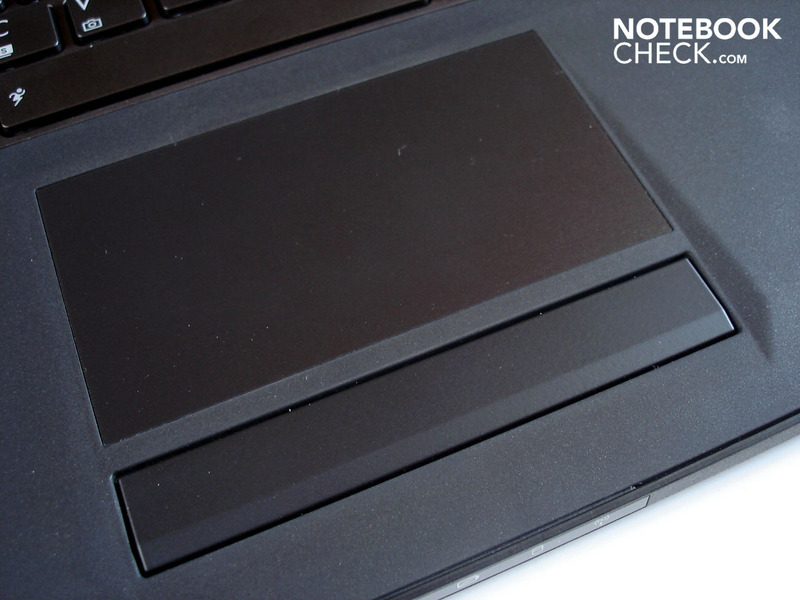 The smooth touchpad is pleasantly large. The keys in the number pad have been made very small. 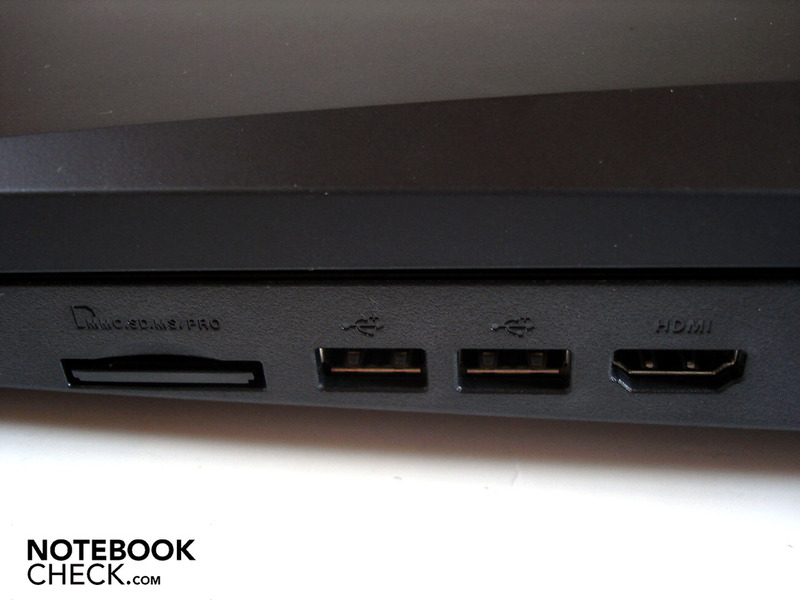 The power socket and VGA port are positioned on the right. The old models mostly had to do without a USB 3.0 port. It is a little stingy to have only two audio ports. The optical drive can not only read Blu-Ray disks but also burn them. The battery life is more or less okay. The mains adaptor is not what you’d call dainty. Various stickers adorn the palm rest. The battery slots into the back of the case. When you open the lid the base unit does not follow. At the back, the case is almost 6 cm high. The maximum opening angle is extremely limited. Two fans dispose of unwanted heat. 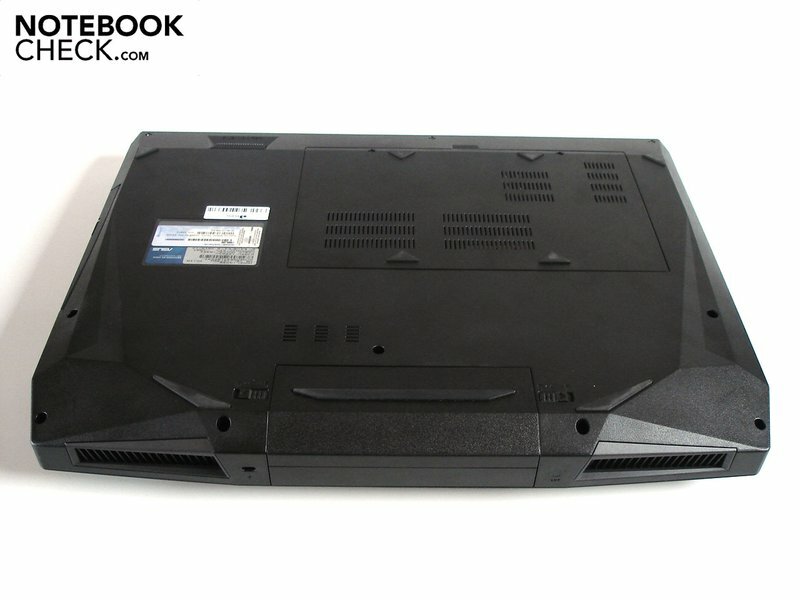 The notebook’s shape is a little like a Lamborghini sports car. A glossy display which picks up strong reflections. An access panel can be removed from the underside. Only the RAM, the hard drives and the WLAN are accessible. The 150 Watt mains adaptor (included). Nvidia’s GeForce GTX 460M is a high-end graphics card. The case has two hard drive slots. 8 GB of DDR3 RAM is more than enough. Both SSHs have a 500 GB capacity. 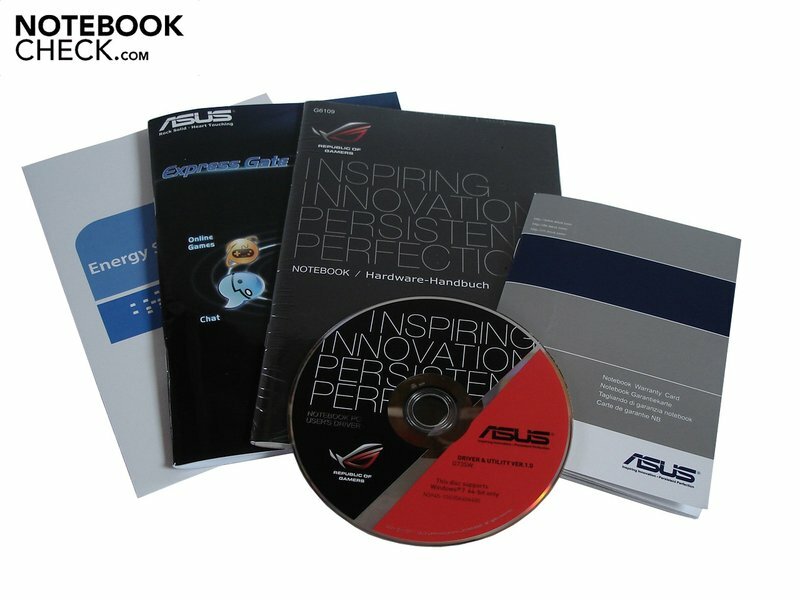 Asus has included several info booklets and a driver and tools DVD with the G73SW. Asus has used a high-class screen and a good sound system. A crisper keyboard and more ports. The cooling system is a complete success. The fans are unobtrusive. 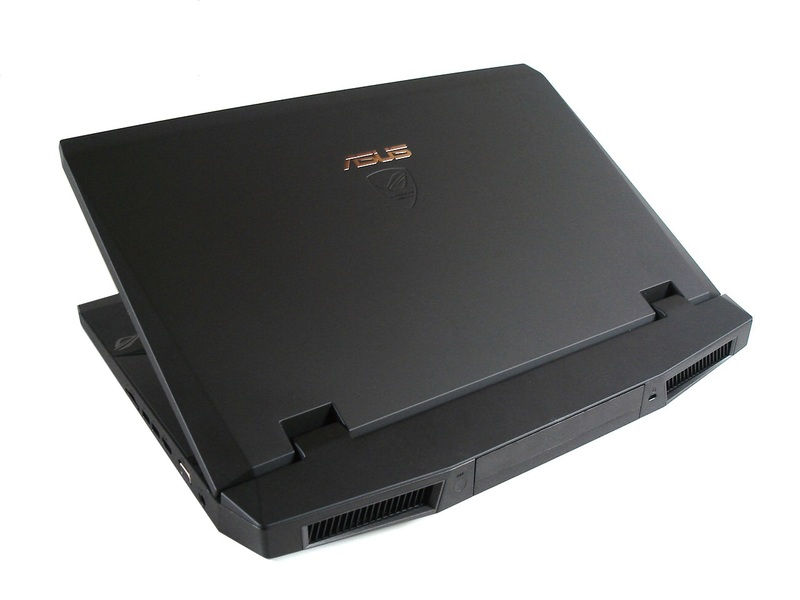 Other gaming notebooks like the Asus G53JW, the Asus G73JH, the Asus G73JW, the DevilTech Fragbook DTX, the Eurocom W860CU Cougar, the mySN XMG P501, the Medion Erazer X6811, the Medion Akoya X7811, the MSI GX660R or the MSI GT663R. Just out: Alienware M17x R3 with Sandy Bridge CPU.